Measuring the water quality of Seymour, like other lakes in Vermont, is an important scientific endeavor because without data, we cannot really know the status of our water. It is also important to do this over time so that trends can be understood and action taken as a result. The primary vehicle to address this is the Vermont Lay Monitoring Program, administered by the Vermont Department of Environmental Conservation (DEC). 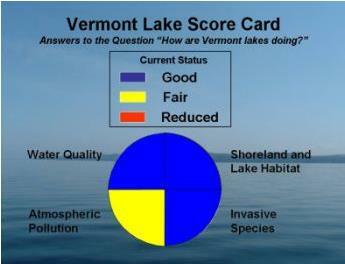 Measurements are done by lay persons on 55 Vermont lakes in the summer of each year. Seymour Lake has participated in this program since its beginning in 1979, but in the early years not all parameters were measured. Unfortunately, it would be valuable to know measurements from previous years, but measurements were never taken because of financial limitations in the program. Seymour has had many lay monitors over the years and we have been lucky to have most recently, Tom Emery. Tom measures water clarity using a Secchi disk as seen below. Using scientific protocols, he collects water samples which he delivers to Vermont DEC’s laboratories to be tested for phosphorus and chlorophyll. The following graph shows the average of the yearly measurements since the program’s inception in 1979 and incorporates the latest data for 2014. These are measurements made by Tom Emery as part of Vermont’s Lay Monitoring Program. Chlorophyll levels, a measure of algae in the water, are relatively constant. Total Phosphorus which is the best indicator of nutrients in the water, showed a higher than normal concentration from 2001 to 2011. Clarity is about the same but we would like a return to the clearer levels of the 80’s and ‘90s. Restoring natural vegetation on the shore to slow runoff of phosphorus into the lake, will do the most for the ongoing health of Seymour Lake. Seymour is rated Good for Invasive species as one would expect due to the total lack of invasive species. Most all lakes are rated Fair for Atmospheric Pollution. All Vermont lakes, but two, have fish consumption advisories because of airborne pollution resulting in mercury contamination in fish. 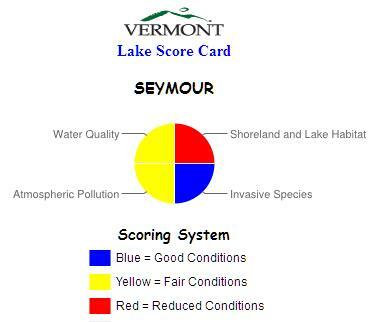 Thus Seymour receives the yellow or fair rating for as do most other Vermont lakes. Neighboring states experience similar issues. Seymour is rated Fair for Water Quality. The Fair designation result is given to lakes with moderately declining trends which are derived from a statistical trend analysis of phosphorus, chlorophyll-a and the Secchi disc data over time. 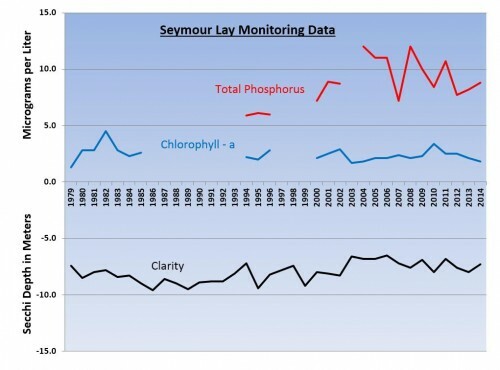 As you can see from the graph of Seymour Lake Lay Monitoring data, there is a moderate downward trend shown overall in both phosphorus and clarity. Also note, that the downward trend seems to have slowed in recent years. Seymour is rated Reduced Conditions for Shoreland and Lake Habitat. This is due to being one of many lakes in Vermont with a high density of shoreland development. As mentioned above in the preamble, the adoption by lake property owners of best practices to minimize the impact of lakeshore disturbance, much of the lakeshore can be returned to favorable habitat of natural vegetation. This is our greatest challenge.